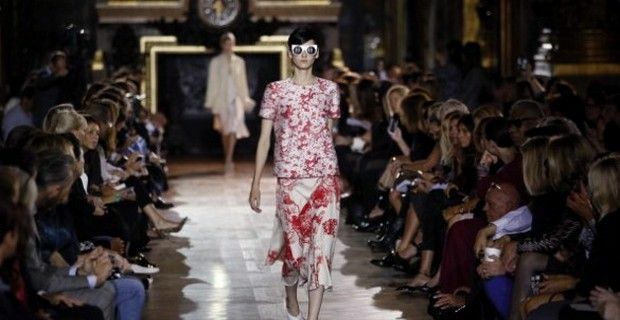 Stella McCartney presented her new 2014 Spring and Summer collection at the Opéra during this week’s very busy 2013 Paris Fashion Week. Not only were top international models Miranda Kerr, Cara Delevingne and Joan Smalls walking the runway for the British designer’s latest collection, Stella also got support from her father, Sir Paul McCartney and his wife Nancy, who were sitting in the front row, but also actress Salma Hayek was present with husband François-Henri Pinault, whose company Kering, partially owns the Stella McCartney brand. After showing off her new and colorful and bold printed 2014 S/S collection for Adidas during the London Fashion late last month; for the Paris Fashion Week, McCartney's ready-to-wear Spring and Summer clothes were definitely more chic and elegant, and very beautiful. There were fluid tunic and skirts that were minimal silhouettes, with contrasting and sublte plays on transparency and opacity in dark blues, whites, blacks and russet. Crocodile patterned dresses and pant suits made their way on the runway as did playsuits, and again in the previous color palette. Also featured were a group of slim styled high waisted pants with matching jackets, that were embellished with elegantly placed zippers, but also long bomber oversize coats for daywear with snake prints, and embroidery and floral jacquards and numerous outfits – silk skirts and tops in floral prints. The show closed out with a stunning of lace slip dresses in array of different colors and necklines, that continued to use the transparency and opacity theme that was seen on the tunic silhouettes. McCartney said of her latest collection: "There was flesh there but we played a lot of opaque so when you saw that flesh it was in subtle, understated way - that is more our woman. It's about her wearing the clothes, not the clothes wearing her."